Great places bring out the best in us, stir us to aspire to greater heights. Great design can make a place unforgettable, bring it life with personality, energy, and promise. KSS is relentless, fearless in imagining what places can be and how they can function. Yesterday’s solutions can not solve today’s challenges. We embrace developing the new place that straddles building archetypes, unlocking the potential within the complex program or the challenging context. Our ideation process is singular in the architecture profession. We are inclusive in our collaborative imagining, and deft in consensus-building. We think like owners, stewarding all resources to the greatest benefit. Our clients trust us to lead them. And we trust our clients, involving them completely and collaboratively in a uniquely transparent process. We believe that design can only achieve greatness when built upon human relationships. 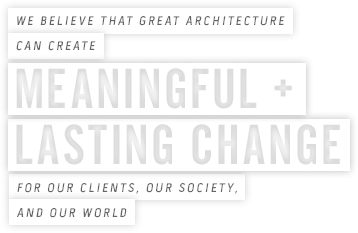 Trust—between client and their community, between architect and their client—rises from accountability. Within that trust we design places that facilitate and celebrate interwoven relationships, creating rich and rewarding communities. The Big Apple. The Empire City. KSS is proud to announce that we have officially opened a location in New York City.drop for summertime lounging at the venue, eight stories above the streets of Philadelphia. The University of Pennsylvania’s new Pennovation Center is a rebel, a futurist, a disruptor. It’s a phenomenon of a building that is also a machine for sparking new growth in the fields of learning, commerce, and community across greater Philadelphia and beyond. What’s more, its bold approach to sustainability that leverages its industrial heritage as an engine for research and learning has earned it a LEED Gold rating. Donning hard hats and construction vests, Uncommon School’s 9th-grade engineering students joined KSS Partner Matt McChesney and Project Architect Mounir Tawadrous on a site tour of their future high school. For one day, the bustling construction site transformed into a hands-on, interactive classroom, bringing project lessons learned and best practices to life through conversations among architects, contractors, and students. Decades of stalled starts are giving way to a new era in Camden development. Business, grassroots activities, plans to attract new residents, and a focus on education are uniting to craft a robust, multiprong approach to change. We believe that environments can fundamentally alter the behavior of individuals with ASD, and that, all too often, individuals find themselves struggling against the parameters of a space. Building ASD-friendly environments has become part of our vocabulary. What is an urban food desert? Often located in low-income, high-development areas urban food deserts or “nutritional wastelands” are running over with fast food restaurants and expensive convenience stores, but little to no affordable healthy food options. For the folks who live in these areas the fresh produce that does exist is outrageously expensive, which makes the trip to the corner fast food restaurant more appealing and economical. As one of the leading issues facing New Jersey, much has been said about the concept of urban food deserts. According to the federal government, New Jersey contains 134 “nutritional wastelands.” How can New Jersey solve this problem locally? Enter the entrepreneurs.